Radiating contemporary elegance, this sleek titanium ring is crafted with a contrasting matt and polished finish. Two subtle sparkling diamonds add just a touch of luxury. Elegant jewellery with added sparkle. 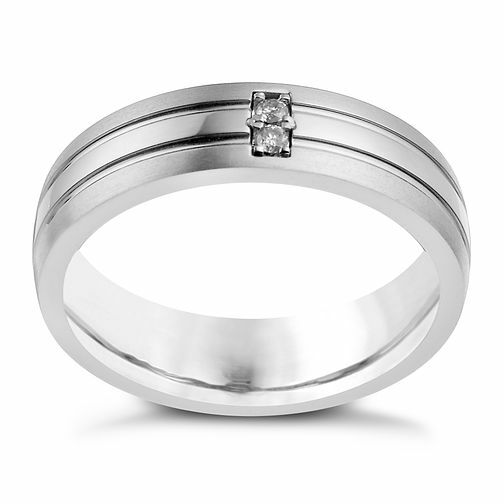 Titanium matt & polished diamond set ring is rated 5.0 out of 5 by 2. Rated 5 out of 5 by Anonymous from Titamium diamond ring I ordered the ring online, the lead time was 7 weeks. Came packaged, but no care was taken with the packaging - the box had a rip in it upon arrival. The ring itself is good, sizing is different to the size chart provided. Usuing the size chart online, I thought I'd need a size bigger than what I ordered.